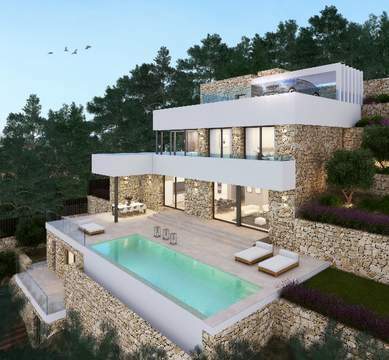 Luxury villla with seaview for sale in Moraira. This stunning villa is build on a 860,08 m2 plot and will have 426,30 m2 of construction over 3 floors connected with an elevator. Basement with double garage, 56m2 cinema room and storrage. Main floor with master bedroom, en-suite bath and dressing, guest toilet and open plan lounge/diner/kitchen fully equipped with white goods, opening up to terraces and huge infinity pool. The first floor has 3 bedrooms with each its own bathroom. The house benefits from underfloor heating, h/c air conditioning and intelligent alarm system. In the outside you will find private landscaped garden, pool side chill-out zone and BBQ area, illuminated grounds, huge covered and open terraces and an outside cloakroom. Approximate date of completion of the work is the end of March 2019.